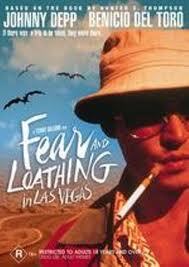 Confession: Until last night I'd never seen Fear and Loathing in Las Vegas. The film stars Johnny Depp as Duke who is really the great white Hunter S. Thompson, the books' author. And frankly, had I seen Depp and Benicio Del Toro as Dr. Gonzo flailing around Vegas in one alchohol, marijuana, mescaline, LSD, cocaine, ether (ether?) and adrenochrome (come on now, really!) - induced hallucination fest after another before I read The Rum Diary; I probably wouldn't have bothered. 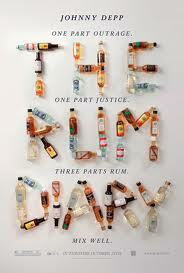 Which would have been a shame because The Rum Diary is a good book with a good story. I know Thompson developed this propensity for experimentation and was gonzo for Gonzo journalism (his invention) and is an icon to many an adventurous spirit, but really, aside from some truly hilarious moments, the film version of Fear and Loathing in Las Vegas is mostly cinematic crap. Watching Johnny Depp wobble around in Captain Jack Swallow rehearsal mode, gripping a cigarette holder between his teeth making his speech almost undecipherable, while a big gutted Benicio Del Tor vomits, curses and swings a sharp blade around is laughable but not for long enoughable! Probably the most fun was picking out the other established actors who appeared in this 1998 film directed by Terry Gilliam: Christina Ricci as the underaged problem girl that Dr. Gonzo picks up, Tobey Maguire as a hitchhiker with long pale blond hair, Cameron Diaz as a video producer, Ellen Barkin, Penn Jillette, Lyle Lovett, Michael Jeter, Katharine Helmond, Craig Bierko and Larraine Newman. Even Mark Harmon as a fellow sports reporter has a line. Nobody though is funnier than Christopher Meloni and Gary Busey. Meloni (SVU's Elliott) as the tres gay hotel desk clerk, Sven, is ab fab as is Busey as the highway patrolman who stops Duke as he's speeding out of town. He turns Duke loose with a warning and a request for "just a little kiss". If only the film were as consistently funny. Instead there are too many mystifying scenes in totally trashed hotel rooms or totally forgettable scenes such as our two heroes picking up Maguire's hitchhiker for a muddled "crazy" drive through the desert with the totally trashed Duke and Dr. Gonzo. And too few scenes like Duke kicking Dr. Gonzo off the spinning carousel bar in the hyperactive Circus Circus casino which make the movie almost - but not quite - worth a watch! Interesting to note that Thompson told Charlie Rose he would have done it differently but says "that was a work of art. In a way." I'll post that interview tomorrow. BUT it was in preparation for the making of Fear and Loathing that Johnny Depp discovered Hunter S. Thompson's unpublished The Rum Diary and pronounced it worth printing. And who then shepherded the book into production as a film. His efforts apparently, increased with Thompson's suicide in 2005. The book, as I've blogged about recently, was written when Thompson was just twenty two, and the novel at least, limits itself to the abuse of alchohol vs all the other drugs Thompson went on to indulge in. And the story, while taking the reader on several wild trips, is actually pretty solid with a defined plot and characters. Is there chaos? Certainly but there's also real conversation and concerns, a confused young man yearning for something other than the here and now and a messy love triangle, that played properly, could actually leave you feeling something. The film opens October 28. Come back to see Charlie Rose interview with Hunter S. Thompson tomorrow. In the meantime, if you missed Fear and Loathing, like I did, I've posted the trailer just for fun. The trailer actually is quite good. The film, not so much.